Fast-swap, interlocking Loc-N-Load™ CMM fixture plates secure and release quickly for repeatable setups with the use of magnets. Inspectors can program several small setups, multi-part fixtures, or add large parts that span multiple plates. 1/2″ thick, 1/4-20 holes available in various sizes with custom sizes available upon request. Interlocking CMM Fixture Plates – .5 thick, 1/4-20 holes. The 3 Docking Rails (12″, 18″ or 30″) bolt in place to your granite. Add Loc-N-Load™ interlocking fixture plates which quickly secure and release with the use of magnets. Keep all more firmly secure by adding an End cap (18″ or 30″) to the fixture. To order, select from these assorted sizes below. FAST-SWAP for VISION. Durable, Scratch-resistant .5” Polycarbonate. ; standard 1/2″ spacing with 1/4-20 holes. More open viewing area for faster inspections. FAST-SWAP for VISION, magnetized, Interchangeable with our LOC-N-LOAD™ aluminum plates. Aluminum Docking Rails have black anodized finish. FAST-SWAP for VISION. Durable, Scratch-resistant .5” Polycarbonate. ; blank plates to customize for your specific needs. The 3 Metric docking rails (360, 540 or 720mm) bolt in place to your granite. Aluminum, 13mm thick. Add Loc-N-Load™ interlocking fixture plates which quickly secure and release with the use of magnets. To order, select from these assorted sizes in the dropbox below. Fast-swap, interlocking Loc-N-Load™ CMM docking rails and fixture plates secure and release quickly for repeatable setups with the use of magnets. The 20 x 20mm hole pattern seamlessly integrates and the plates are quickly assembled without tools. Once assembled, inspectors can program several small setups, multi-part fixtures, or add large parts that span multiple plates. The docking rail stays out of the probe’s travel to maximize the CMM’s work envelope. Loc-N-Load™ fixture plates can be ordered with air assist. Let your CMM and fixture plates do the heavy work. With a flip of a switch and one pinky finger, inspectors can easily glide the weight of an anvil across the granite! FAST-SWAP for VISION. Durable, Scratch-resistant 13mm thick Polycarbonate. ; blank plates to customize for your specific needs. Metric FAST-SWAP for VISION. Durable, Scratch-resistant 13mm Polycarbonate. Standard 10mm spacing with M6 holes. More open viewing area for faster inspections. MT-POST-2 Modular Tower System - Posts - 2"
MT-POST-4 Modular Tower System - Posts - 4"
STOF-050-400 Silver-Bullet™ Stainless Steel Stand-offs - Inch - .5"x4"
Silver-Bullet™ stand-offs are a precision turned stainless steel for fixturing heavy parts. All products are high quality and proudly made in the USA! STOF-050-600 Silver-Bullet™ Stainless Steel Stand-offs - Inch - .5"x6"
STOF-075-400 Silver-Bullet™ Stainless Steel Stand-offs - Inch - .75"x4"
STOF-075-600 Silver-Bullet™ Stainless Steel Stand-offs - Inch - .75"x6"
Silver-Bullet™ stand-offs are a precision turned steel for fixturing heavy parts. All products are high quality and proudly made in the USA! Silver-Bullet™ stand-offs are a precision turned anodized aluminum. All products are high quality and proudly made in the USA! Sizes: 25mm, 50mm and 75mm stand-offs. SIBU-SO-1 Silver-Bullet™ Stand-Offs - Aluminum - 1"
SIBU-SO-2 Silver-Bullet™ Stand-Offs - Aluminum - 2"
SIBU-SO-3 Silver-Bullet™ Stand-Offs - Aluminum - 3"
Precision cut from 14 gauge brushed stainless steel, these alignment rails and stops are versatile and affordable. Use them on most CMM fixture plates. Includes standard button head screws. SS-01 Simple-Stop™ - Rails and Stops - Inch - 2.75x2.75"
SS-02 Simple-Stop™ - Rails and Stops - Inch - 3.75x3.75"
SS-03 Simple-Stop™ - Rails and Stops - Inch - 2.25x4.25"
SS-04 Simple-Stop™ - Rails and Stops - Inch - 6.75x6.75"
SS-05 Simple-Stop™ - Rails and Stops - Inch - 1.75x1.75"
SS-06 Simple-Stop™ - Rails and Stops - Inch - 3.75x3"
SS-07 Simple-Stop™ - Rails and Stops - Inch - 1.5x6"
The Adjustable Platform is designed to be used with a hold down for extending parts over the viewing area for vision inspection. Made from acrylic with grooves added to secure parts, the platform can be adjusted for height along the shaft of the Trigger-Finger™ or Trigger-Point™ hold-downs. (.5″ thick x 4.25 long clear acrylic – set screw included). 1 each. ER Collet chuck opening from .012” to .312 (.3mm – 8mm) diameter. COM-FXPL-P100 Comparator Fixture Plate 5 X 14"
Cross-Bow™ spring clamps hold pieces in place quickly and securely. Parts can be released and replaced with the squeeze of a trigger. It can easily be used on a fixture plate for one-piece inspections or customized for multiple-part fixtures. The gripping edge of the D-Block™ works like a spring to secure and release your work. Parts are held with plenty of force for measuring and with a squeeze of the trigger a part can be quickly released and replaced. Part change-over is one-handed with no need for tools and tape. The Hole Adjuster is a 1×3″ black anodized aluminum tool designed to incrementally adjust the Trigger-Finger™ non-marring hold-down (easy grip thumb screw included) Sold in sets of 2 each. Indexable Loc-N-Load™ Plate allows rotation and access to complex parts. Now it’s easier than ever to adapt your inspection fixtures to the LEANest option on the market. Fastening this .5″ thick aluminum adapter plate to existing fixtures allows you to “dock” them into the Loc-N-Load docking rail. Make use of existing fixtures while adopting the newest LEAN concepts for inspection. Now it’s easier than ever to adapt your inspection fixtures to the LEANest option on the market. Fastening this 13mm thick aluminum adapter plate to existing fixtures allows you to “dock” them into the Loc-N-Load docking rail. Make use of existing fixtures while adopting the newest LEAN concepts for inspection. Locate a part on the granite quickly with Loc-N-Load 6″ angle plate/stop. Add Inspection Arsenal work holding to the 1/4-20 threaded 1×1″ hole pattern as needed. Locate a part on the granite quickly with Loc-N-Load 180mm angle plate/stop. Add Inspection Arsenal work holding to the M6 threaded 20x20mm hole pattern as needed. The 24 x 12″ Docking Rail is for use with portable Gage fixture systems. Add Loc-N-Load™ interlocking fixture plates which quickly secure and release with the use of magnets. Add multiple fixtures to speed up inspections on the floor. The 540 x 300mm Docking Plate is for use with portable 3D Gage Arm fixture systems. Add Loc-N-Load™ interlocking fixture plates which quickly secure and release with the use of magnets. Add multiple fixtures to speed up inspections on the floor. Special Indicator Ball Plate, .5” thick, M8x1.25 threaded hole, Aluminum. Mount your qualifying ball on this dedicated plate to get it safely out of the way when you’re not using it and avoid costly probe crashes! Special Indicator Ball Plate, 50x180mm, Aluminum. Mount your qualifying ball on this dedicated plate to get it safely out of the way when you’re not using it and avoid costly probe crashes! The Radial Loc-N-Load™ plate is 8 inches in diameter, 1/2” thick black hard anodized aluminum with ¼-20 threaded holes. Because not every part is square we decided to use a radial hole pattern rather than a grid pattern in ½” offsets starting from the center hole. The smaller bolt circles have 30° spacing and the larger ones are 15°. This magnetic CMM Riser set offers another holding option for steel parts during CMM inspection. Magnetic clamping allows for unlimited probe access. Combine with other stand-off components for fixture building. 1/40-20 thread. PLATE SOLD SEPARATELY. Mounting base for 2″ tower system. Black anodized aluminum. 2″ cube, aluminum black anodized, 1/4-20 threaded holes with 3/8-16 threaded hole to accept 1/2″ post for rotating blocks. Male/female connectors to create stability. This 6″ docking rail is available individually. Combined with the 6 x 12″ fixture plates, are perfect for your optical comparators’ inspection applications. This 180mm docking rail is available individually. Combined with the 180 x 360mm fixture plates, are perfect for your optical comparators’ inspection applications. OpenSight™ Polycarbonate corner plate 6”x6”x.5” thick, Hole pattern shown is for an OGP 200 and will be made to your specifications. Adjustable opening is able to secure parts of .0 to 2.1” (0mm to 53.3mm) in thickness. Clear anodized aluminum. Fits ¼-20, 1/2” and 1” fixture plate hole patterns. Inquire about Riser-Grip™ for metric hole patterns. Multi-Vise Connector Pack: Elbows, Tees and 6′ Tubing. Air Regulator with Pressure Gauge and Mounting Bracket for use with Rapid-Loc™ Air Vise. Includes built-in Pressure Gauge, regulating range = 7 – 125 psi. Dimensions = 4-1/2″ H x 2-5/8″ w.
Create your own custom assembly with soft jaws and fittings or ask Phillips Precision for advice. Air Regulator with Pressure Gauge and Mounting Bracket for use with Rapid-Loc™ Air Vise. Includes built-in Pressure Gauge, regulating range = 7 – 125 psi. Dimensions = 63.5 H x 36.5 W (mm). The machinable aluminum soft jaws can hold one part or multiple parts per vise. Use with the Rapid-Loc™ Vise for holding parts during CMM inspection. Can be machined to hold one part or multiple parts per vise. One movable and one fixed side. Made from aluminum – .5″ thick x 2.5″ length, set screws included. Set of 2. Can be machined to hold one part or multiple parts per vise. One movable and one fixed side. Made from aluminum. Set screws included. Set of 2. To use the Rapid-Loc™ vise for a Metric application, simply purchase the RLM-ADPT-02, Adapter Base Plate and mount to your vise. RL-Port-Plugs: 1/8 tube to 1/8 NPT 4 port w/plugs Additional Multi-Vise Accessories – Order 1 pack per vise for two or more vise setups. RL-VISE-SYS02 Rapid-Loc™ Pneumatic Air Vise SYSTEM, (63.5mm) assembled w/standard Accessories & Fittings (Rapid-Loc™ Product Sheet available). Additional Multi-Vise Accessories – Order 1 pack per vise for two or more vise setups. Adapt the Rapid-Loc™ Air Vise for your metric plates. To hold parts of infinite size and shape, we’ve plucked the legs off the 3-legged Spider Vise™ to give inspectors more options. SC-06-03 Spider Clamp - 3 Legged - 6"
Inch (SIBU-SO-100) – Thread is 1/4-20. Four each of 1”, 2” and 3” stand-offs. Metric (SIBU-SO-100M) – Thread is M6. Four each of 25mm, 50mm and 75mm stand-offs. Precision cut from 14 gauge brushed stainless steel, these alignment rails and stops are versatile and affordable. Use them on most CMM fixture plates. Includes standard button head screws. 1/4-20 threads. A two-piece vise especially designed for use on Loc-N-Load™ or other inspection fixture plates. The Spring-Loc™ is an extremely low profile (.072″) clamp capable of producing approximately 10 lbs. of clamping pressure. It provides a simple and quick method for locating and holding parts for Laser etching, CMM and Vision Systems. Precision cut from 14 gauge brushed stainless steel with a serrated edge. Measures 2.75″ x 2.75″. 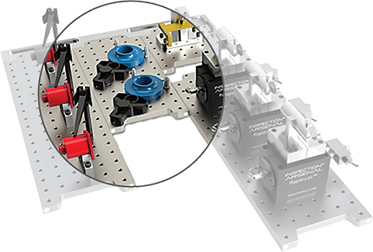 This alignment stop for vision systems is versatile and affordable. Use on most CMM fixture plates. Includes standard button head screws. 1/4-20 threads. Includes standard button head screws. 1/4-20 threads. Precision cut from 14 gauge brushed stainless steel with a serrated edge. Measures 70mm x 70mm. This alignment stop for vision systems is versatile and affordable. Use on most CMM fixture plates. Includes standard button head screws. 1/4-20 threads. Inch – 1/2”, ¾”, 1”, and 2” are made from plastic and steel with ¼-20” threads. Metric – 12.5, 20, 25 and 50mm are made from plastic and steel with M6 threads. Enhance other work holding with risers and adjustable stand-offs that can be angled in any direction. Combine with other Stand-Off & Rest Pad Set or Clamp Kits for fixture building to add flexibility in fixture design for CMM inspections. PLUS – 1 ea. VIS-KIT-01 Open-Sight™ 34-pc work holding clamp kit containing non-marring hold downs, stops and stand-offs. Affordable enough to add to each Vision / CMM. PLUS – (1) VIS-KIT-01 Open-Sight™ 34-pc work holding clamp kit containing non-marring hold downs, stops and stand-offs. PLUS – 1 ea. VIS-KIT-01 Open-Sight™ 34-pc Vision work holding clamp kit containing non-marring hold downs, stops and stand-offs. PLUS – (1) TR-KIT-01 WORKS Kit, 145-pc work holding kit. This smaller fixture system is perfect for smaller CMM inspection applications. Plus – (1) TR-KIT-02 Complete Kit, 69+ pc work holding kit. PLUS – 1 ea. TR-KIT-03 Starter Kit, 50+ pc work holding kit. This fixture system is perfect for smaller CMM inspection applications. PLUS – (1) VIS-KIT-01 Open-Sight™ 34 pc work holding clamp kit containing non-marring hold downs, stops and stand-offs. Plus – (1) TR-KIT-01 Inspection Arsenal™ 145-piece Work Holding Kit with non-marring hold downs, v-blocks, stops, and stand-offs. Affordable enough to add to each CMM. PLUS – (1) TR-KIT-02 Inspection Arsenal™ 69+ piece Complete Work Holding Kit with non-marring hold downs, v-blocks, stops, and stand-offs. Plus – (1) TR-KIT-03 Inspection Arsenal™ 58 piece work holding Starter Kit with non-marring hold downs, v-blocks, stops, and stand-offs. Plus – (1) TR-KIT-01 Inspection Arsenal™ 146 piece the “WORKS” Work Holding Kit with non-marring hold downs, v-blocks, stops, and stand-offs. PLUS – (1) TR-KIT-02 Inspection Arsenal™ 69+ pc work holding Complete Kit containing non-marring hold downs, v-blocks, stops and stand-offs. Plus – (1) TR-KIT-03 Starter Kit, 50+ pc work holding kit containing non-marring hold downs, v-blocks, stops, and stand-offs. Pre-configured for all portable gage arms and laser trackers. 1/2″ thick clear anodized aluminum, 1 x 1″ hole pattern, 1/4-20 thread. PLUS – (1) TR-KIT-02, Complete Kit, 69-pc work holding kit. 1 ea. TR-KIT-03 STARTER Kit, 50+ pcs. work holding clamps. STARTER Kit includes 50+ pcs. non-marring hold downs, v-blocks, stops, and stand-offs. Affordable enough to add to each optical comparator. This smaller fixture system is perfect for your optical comparators’ inspection applications. Plus – (1) TR-KIT-02M, Complete Kit, 69-pc clamp kit. M6 threads. STARTER Kit includes 58 piece non-marring hold downs, v-blocks, stops, and stand-offs. Affordable enough to add to each optical comparator. Plus – (1) TR-KIT-01M, WORKS Kit, 138+ pc. work holding Kit. Plus – (1) TR-KIT-02M, Complete Kit, 69+ pc. work holding Kit. Plus (1) TR-KIT-03M, Starter Kit, 58 pc. work holding Kit. PLUS – 1 ea. VIS-KIT-01M Open-Sight™ 34 pc work holding clamp kit containing non-marring hold downs, stops and stand-offs. Inspection Arsenal@ The “Works” Kit. A combination of components found in Inspection Arsenal® clamp sets, including hold-downs, spring clamps, stops, rails, stand-offs, magnetic components, and more. This kit contains everything you need to create several fixtures across multiple CMMs. Inspection Arsenal® Complete Kit: Full kit includes everything you need to inspect most any part. Fast trigger-action, non-marring, low-profile, no tools or messy tape and glue. Inspection Arsenal™ Starter Kit: This kit is a sampling of components perfect for all traditional CMM’s. Fast trigger-action, non-marring, low-profile, no tools or messy tape and glue. Inspection Arsenal® Starter Kit: This kit is a sampling of components perfect for all traditional CMM’s. Fast trigger-action, non-marring, low-profile, no tools or messy tape and glue. Productivity improvements are achieved by the unique design – the gripping edge of the Trigger-Block™ works like a trigger or spring to secure and release your work. Parts are held with plenty of force for measuring and with a squeeze of the trigger a part can be quickly released and replaced. Part change-over is one-handed with no need for tools and tape. 3” Steel, Black Oxide coating with male and female ¼-20 thread ends, Use as stand-offs for any clamping components. Metric: with male and female M6 thread ends. 3” Steel, Black Oxide coating with male and female M6 thread ends. Use as stand-offs for any clamping components. Individual plastic Trigger-Finger™ hold downs to add to your shafts. The gripping edge of the Trigger-Finger™ works like a spring to secure and release your work. Parts are held with plenty of force for measuring and with a squeeze of the trigger a part can be quickly released and replaced. Part change-over is one-handed with no need for tools and tape. V-Block, magnetic, aluminum stand-off. Set of two. Use vertically or horizontally as a stop to create simple setups. Add 3″ steel shafts to gain height. Sizes: 90° included angle. V-Block, magnetic, aluminum stand-off. Set of two. Use vertically or horizontally as a stop to create simple setups. Add 76mm steel shafts to gain height. Sizes: 90° included angle. COMPLETE access to the entire edge of the part without interruption. OPEN-SIGHT™ for Vision Work holding kit includes hold-downs, hole adjusters, clamps, and stops . Use with Inspection Arsenal™ OPEN-SIGHT™ clear polycarbonate plates for lean Vision fixturing for Vision inspections. OPEN-SIGHT™ Vision Work holding kit includes 2 Trigger-Finger™ plastic hold-downs, 2 Trigger-Point™ thin steel tip hold downs, 2 hole adjusters, 2 Slide-Loc™ spring clamps, 2 Sliding Stop™ scalloped stops, 3 Simple-Stop™ (#01-OS, #06, #07) rails, and an adjustable platform to extend parts over the viewing area. Plus screws, hex key, and 5S foam insert.